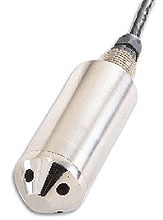 OMEGA’s PX78 Series pressure transducer is a fully submersible transducer designed for liquid level and depth measurement. Its all stainless steel hermetically sealed housing makes it suitable for immersion in most industrial liquids and oils. A standard 15 metre vented cable (longer lengths available) provides an atmospheric pressure reference. The PX78 with a 5000 ohm bridge is designed to work with the DMD-16 and DMD-17 in line amplifiers for long distance transmission of the signal. Standard cable length is 15 metres, contact our sales department to order non-standard lengths.